Ella Smith, 8, suffers from a rare form of cancer. Her parents say the strength she's shown in her two-year battle fortifies their resolve. 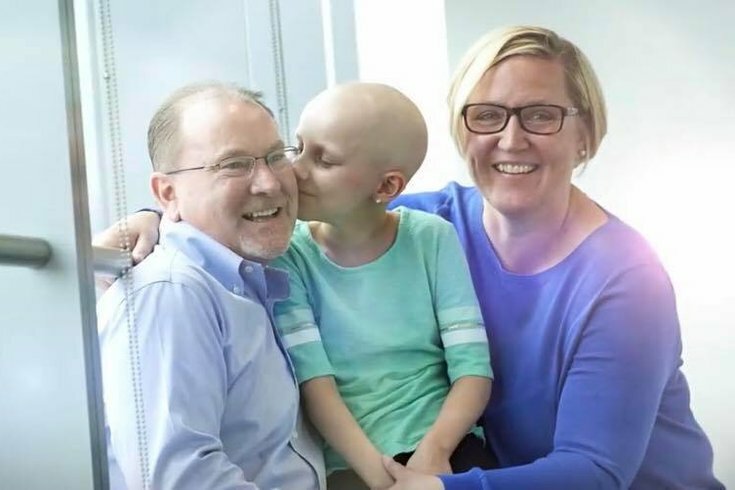 For more than a quarter of her young life, 8-year-old Ella Smith has waged a fierce battle against the rare form of cancer that threatens to end it. The Royersford, Montgomery County girl was diagnosed with rhabdomyoscaroma – in which cancer cells form a mass in muscle tissue – in May 2016. “We went in for an ultrasound to see if she had kidney stones,” her mother Karen recalled of their visit to a CHOP urgent care site in King of Prussia that led to the diagnosis a week later. Chemotherapy led to 28 rounds of radiation – including proton therapy – which led, that September, to surgery to remove her shrunken tumor and remission. The good news wouldn’t last long, however. A year later, concerns about Ella’s breathing prompted a return trip to urgent care and the discovery that the cancer had metastasized to her lungs. The battle continues for Ella – as a Children's Hospital of Philadelphia ambassador she is featured on its billboards – who will be the focus of a fundraiser this weekend for her and her family at the Elmwood Park Zoo in Norristown. “EllapaZoola” is scheduled to take place from noon to 5 p.m. this Sunday. “She’s the strongest little girl in the world,” reads the description of the event offering tickets for $20, $35 or $50, with $500 sponsorships for 10 tickets and a reserved table. On Monday morning, Ella, her family and C.J. Santangelo of the A-Team headed to NBC Philadelphia’s studios for a live segment to help spread word about the upcoming event. Afterwards, Karen Smith spoke about what the past two years have been like for her daughter and family. Sure, “she was a little scared” when the live cameras started rolling, but Ella is doing quite well, all things considered. After a full year of treatment following the relapse, she’s now “on a maintenance program to keep her where she’s at,” Karen said. Santangelo is hoping “EllapaZoola” will draw enough support to match a similar fundraiser from last August – for a young cancer patient named Lilyanna Pagnotta. “Lilypalooza” raised about $50,000 for the family of a young girl who, along with Ella and another young girl, will head to an Eagles cancer event on Tuesday night. “It’s a scary situation,” said Santangelo of Ella’s battle, “but we have faith in her." EllapaZoola is scheduled for 12 to 5 p.m. at Elmwood Park Zoo (1661 Harding Blvd. in Norristown). Tickets can be purchased ahead of time via this link.